This six drawer dresser brings you transitional style and essential bedroom storage. Use the six drawers to hold folded clothing, extra bedding and more. Sides have slight curves, simple oval drawer knobs and a dark wood finish come together to give this piece a look that can be coordinated with the rest of the pieces in your home. Drawer fronts are textured for a unique look. Use this dresser with a mirror for even more function and style in your bedroom. 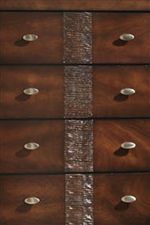 The Jenny 6 Drawer Dresser by Elements at Royal Furniture in the Memphis, Nashville, Jackson, Birmingham area. Product availability may vary. Contact us for the most current availability on this product. Finish & Paint Options Dark brown wood finish. Handles & Hardware Silver, oval drawer pulls. Case Detail Simple, clean edges with curved sides. The Jenny collection brings you transitional bedroom furniture with storage and style ideal for your master bedroom or any bedroom in your home. The bed can become the focal point of a room with its tufted upholstered head and footboard, gentle curves and classic dark wood finish. Storage pieces include a dresser, chest and nightstand which are perfect for holding folded clothes and any other items. Simple drawers knobs, curved sides and textured drawer fronts all come together to give the Jenny collection a transitional look perfect for your bedroom. The Jenny collection is a great option if you are looking for Transitional furniture in the Memphis, Nashville, Jackson, Birmingham area. 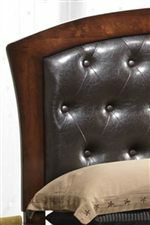 Browse other items in the Jenny collection from Royal Furniture in the Memphis, Nashville, Jackson, Birmingham area.